We’ve got a new (to us) car!! 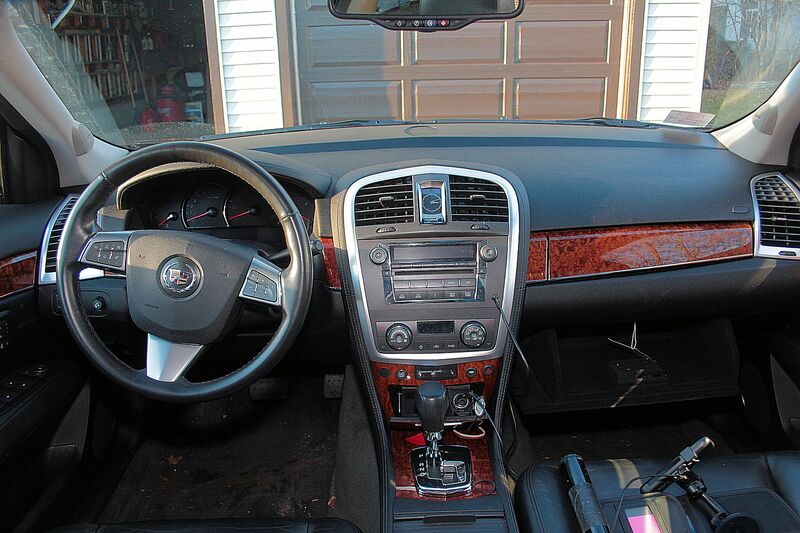 A 2008 Cadillac SRX! The 1997 Plymouth Voyager minivan we bought in 1999 has served us well for the past 14 years. It has 201,000+ miles on it now, and still runs well, but the body-rot is getting to be more than minimal (lots of Bondo in the past few years), to the point that I was a bit concerned whether it would pass inspection this past September (it did). So I decided to keep my eye out for a replacement while I wasn’t in crisis mode to find a replacement. A couple of weeks ago, I found it. 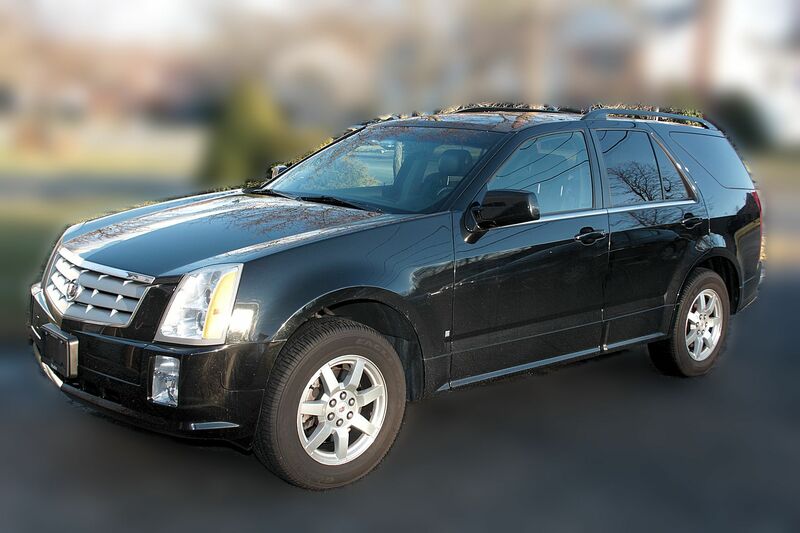 I had seen an ad in the MITRE in-house classifieds for a 2008 Cadillac SRX crossover with 73,000 miles for $13,499. It was listed as having all the bells and whistles except no rear-seat DVD theater system and no GPS-navigation system – both things I had no interest in. It had a 3.6 liter V6 engine with 255 HP @ 6,500 rpm, 4-doors with power hatch, rear-wheel-drive, leather and wood interior, jumbo opening moon-roof, dual power-controlled and heated seats (seat and seat-back) with lumbar adjustment, dual climate controls, 6-CD changer driving a Bose audio system, power lift-gate, and a power fold-away 3rd seat (the vehicle seats seven, as long as the two in the way-back are little kids, double-jointed, or double-amputees). The pictures looked good and the price looked quite reasonable, but I didn’t follow up on it; I wasn’t in crisis mode yet. I check the in-house classifieds on a semi-regular basis, just to see what’s available, and a few weeks later the SRX was still listed, but the price had dropped to $12,999. I talked it over with Lynn and decided to check it out. I called and arranged an inspection and test-drive, and I asked if they minded if I brought the car to my mechanic on the test drive so he could check it out for me (I know a bit about cars, but I’m nowhere near an expert, especially with new-fangled computer-controlled vehicles). They assented. I also asked for the VIN ahead of time so I could pull a CarFax report in the vehicle, which they provided. The CarFax report was clean as a whistle, and if the list of features and options was accurate, then they were selling the car for at least a few thousand LESS than its Kelley Blue Book value. I was getting more interested. The test drive was great, but my mechanic found a few problems; the coolant and power steering fluid needed flushing and replacement, and the boot-cover on the differential (remember, rear-wheel drive) was cracked and needed replacing. The fluid flushes were no big deal, but the cracked boot was going to cost $400-$600 to replace. I gave the owners a copy of the report, and asked if they’d drop the price another $200 to split the repair cost; I knew they were asking a price well below the book value to begin with, and they were selling the car and down-sizing because they were getting divorced, so it didn’t seem fair to me to ask them to drop it much more. They consented so we agreed on $12,800 as a sale price. The NADA book value on the car (for insurance purposes) is $18,200! I paid for the car and took possession of it on Monday the 2nd of December, but because it was a private sale and they owed money on a car loan still, the title was being held by their bank. After the money exchange, the previous owner followed me from MITRE to our house at lunchtime, parked the car in our driveway, took off the plates, and handed over the keys. Thus began my wait for the title, which I need in order to transfer the plates from the Voyager to the SRX, and I’m still waiting! Massachusetts is an “electronic vehicle title” state, which means that the lending company doesn’t hold a paper title to the vehicle. When the loan gets paid off, the lender tells the MA RMV to re-issue the title in the payee’s name. Then the payee signs over the back to the new buyer (me) and the new buyer takes the signed-over title and a transfer-of-registration form (signed by the insurance company, verifying that the vehicle and owner is insured) to the registry to get the new registration. The weak link in this electronic chain is that the MA registry can take up to FIFTEEN DAYS to issue the title, so my SRX sits in the garage, without plates, and I can’t drive it out of my driveway! I am not a fan of delayed gratification!! Delayed gratification indeed! I attempted to contact the seller’s bank (Bank of America, for those who are curious, ranked the 12th largest bank in the world by total assets and the 2nd largest in the US) to enquire about the status of the title release, but without an account they would not talk to me. The seller also tried to contact them on my behalf, but his loan account was now closed so he no longer had an account and they would not talk to him either. I waited not-very-patiently for the title to show up through that week, and with the count at eleven days with the unregistered SRX sitting in my garage, it occurred to me that my not-trivial IRA account with Merrill-Lynch (owned by BofA) might have some leverage, so I contacted my M-L broker to see if he might have a way to break down the BofA walls for me. He did – the Sr. VP in his office contacted the BofA loan department and dope-slapped them. According to the VP, BofA had been sitting on the checks (certified BANK checks!!) for almost TWO WEEKS to make sure they cleared. And certified bank checks are untrustworthy…. How?? The title arrived three business days later (as promised to the VP), and my first attempt to register the SRX was made Wednesday afternoon, the 18th of December. Unfortunately, one of the two check-boxes associated with the verified odometer mileage stated on the back of the title (the part that gets filled out when the vehicle gets sold) got checked in error. A common assumption is that one check box is to indicate the stated odometer mileage is correct, and the other check box is to indicate that it is in error (odometer not working correctly). Nope. BOTH check boxes indicate a problem (odometer not working correctly, OR odometer rolled around to zero and started over). Because the box was incorrectly checked, the first trip to the registry failed – I had to get a signed and notarized affidavit saying that the checked box was incorrectly checked. I got the signed and notarized affidavit the next day, and THAT afternoon (19 December) the SRX was registered and finally street-legal. Victory was finally mine! Seventeen days in waiting. Not my idea of the benefits of speedy electronic banking. Gold coins sent via Pony Express would’ve been faster. The “What did I get myself into” story involves a directional signal bulb. I noticed on the way up to the BallotBox in Maine the day after Christmas that my right directional signal was fast-flashing, a sign that one of the bulbs was burned out (I had just gotten the car inspected two days before and it was fine then). I checked at a rest area and it was the front right bulb that was out, so at least people behind me could see a signal (changing lanes on a highway in a snowstorm is dangerous enough WITH working blinkers). We needed to stop at Wally-World (a.k.a. WalMart) in Cook’s Corner ME for some other stuff, so I had Lynn look in the manual for the bulb # while I drove so I could pick one up at the store. Strangely, in the BULB REPLACEMENT section of the manual, it says (and I quote): “It is recommended that all bulbs be replaced by your dealer/retailer.” That’s it. That’s the entire section of the manual, reproduced right here. Hmmmm. At WalMart I used the bulb lookup book and found what bulb to buy (two bulbs for $4.99). The next day I had some errands to run, so before running the errands I popped the hood to replace the bulb… and… I… could… not… find… ANY… way… to… get… to… the… damn… bulb… housing… WTF??? So I added a stop to the newly opened Sullivan Tire and Auto Center in Damariscotta ME (Sullivan Tire in Bedford MA has been our auto repair place for 25+ years now). I went in and told Ryan (we had work done on Lynn’s car up here recently so we know the people AND their names) that I knew a bit about cars but I was embarrassed to say I could not find how or where to change a directional bulb on a used car I just bought. He asked what kind of car it was, and when I told him a 2008 Cadillac SRX, he smirked and said he could take care of it. I gave him the key and told him I was going to walk across the street to Mickey-D’s for lunch and would be right back. This entry was posted in Family, General, Woburn. Bookmark the permalink.